This report has been amended since it’s original posting, which inaccurately stated that Chancellor Henry Yang “left Cheadle Hall unnoticed” during the hunger strike and that he did not meet with the protesters. In fact, Yang came back from the Bay Area specifically to meet with the hunger strikers and did meet with them, until 2:30 in the morning. 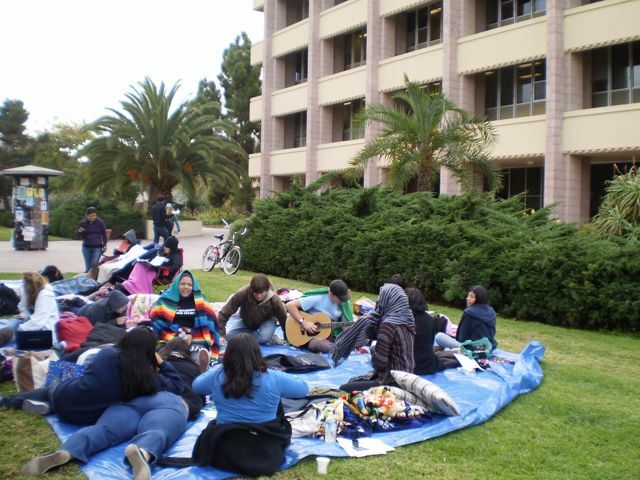 Upwards of 40 UCSB students, faculty, and staff united on Tuesday morning, December 3, to begin a 27-hour fast to protest fee hikes that the UC Regents passed two weeks earlier. In addition to the fast, participants slept in the strategic space they took over between Cheadle Hall-where offices of the chancellor and administration are located-and Campbell Hall, in and out of which hundreds of students pour daily for class lectures. At least five workers from ASFME physically attended, along with Santa Barbara City Councilmember and California State Assembly hopeful Das Williams, who “is not fasting with us on campus but he is fasting with us in solidarity,” said Iris Bustos, a fourth-year student and event organizer, citing two statements Williams released addressing UCSB activism. The period of fasting was anything but monotonous. 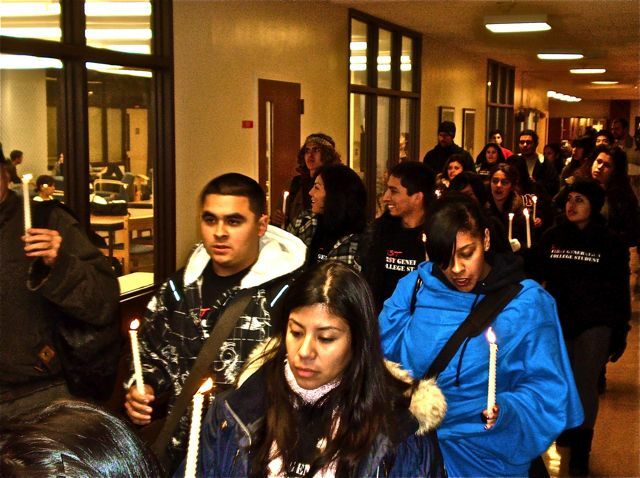 Participants had a full agenda beginning with a three-hour study session, various performances and speeches, more studying, a candlelight vigil, and a pachanga (or “party with a purpose”) before they buried themselves in warm clothes and thick blankets for a nippy night of sleep under the full moon. 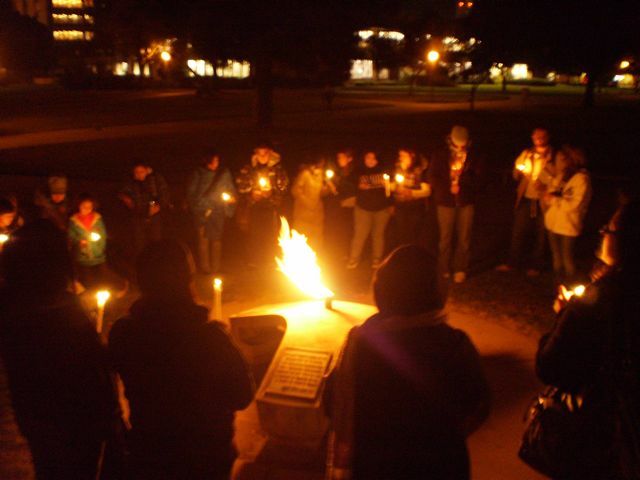 The candlelight vigil took 34 candle-bearing, silent students activists, including four playful children, from Cheadle Hall, through busy Davidson Library, and up to the eternal flame that endlessly burns atop a modest, grassy hill in the center of campus. Surrounding the flame under the full moon, all were encouraged to share testimonies, through foggy breath, of the personal hardships they and their families face, currently being perpetuated by the rising costs of quality education. The study sessions, to which the fasters dedicated nine hours total, were both necessary and strategic. “Since this is dead week, it is a really good reminder to the campus community that we are taking our studies seriously,” said Bustos. Participants are also collecting support for their long, detailed letter to the Regents and to the Office of the Presidents, which outlines in detail demands and laments of UCSB students, faculty, and workers as a united front. Among other points, they argue for an immediate halt of fee hikes and salary cuts, and a decision-making process that did not involve those who are directly affected. Upon awaking with the sunrise, participants engaged in another three-hour study session, followed by a colorful and lively traditional tribal drum and dance performance in front of Cheadle Hall. The impassioned performance moved many fasters to tears, including Professor Armbruster. Finally, fast was broken by all simultaneously at 12 p.m., after Armbruster, and students Bustos and Maricela Morales, fellow organizers, distributed bread from a basket. As of Wednesday morning, 1,262 UC students and workers had registered their support for the Facebook aspect of the event, whether they could physically attend or not. “If they are there in spirit,” said Armbruster, “that’s all that counts.” The remainder of the afternoon saw the uplifted spirit of finally-nourished fasters, who whacked a pi±ata, distributed soup, and snacked cheerfully, seemingly pleased with their efforts.